UMBC Mock Trial has finished the most successful season in its eight-year history, placing eighth at the American Mock Trial Association National Championship Tournament in Philadelphia. This impressive ranking concludes a season where over 750 teams competed across the nation. Sophomore Sydney Gaskins received the All-American Attorney Award, the highest individual honor in college mock trial. The team swept Penn State in the first round and tied with University of California, Berkeley and Columbia University in the second and third rounds, respectively. In the fourth round, UMBC fought Yale University, the eventual champion, to a draw, narrowly missing advancing to the final round. Each round highlighted the team’s preparation and allowed for individuals to demonstrate expertise gained over a rigorous season. “I am so honored to make my community proud and represent not only our program but UMBC as a whole in such a positive way,” says Gaskins. UMBC Mock Trial A-Team in front of Franklin Institute in Philadelphia. 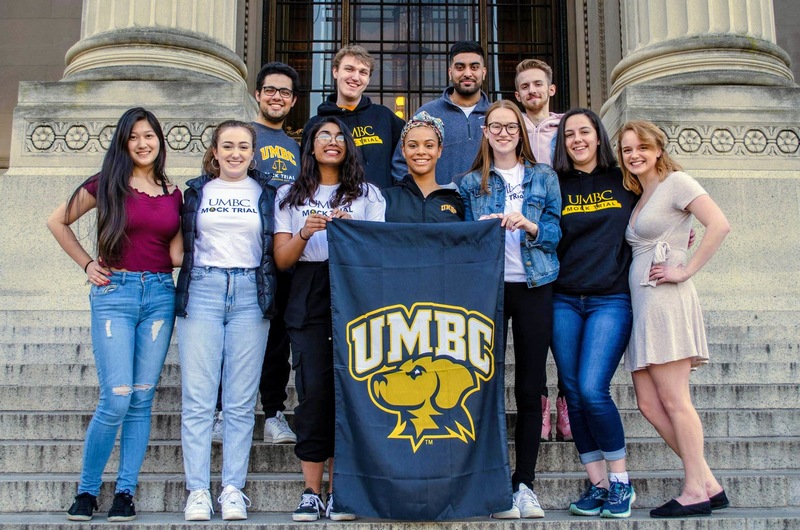 UMBC’s leading Mock Trial A-Team includes Gaskins, ’21, political science; Linnea Collins ’21, global studies; Thomas Kiley ’21, chemistry; Ethan Hudson ’21, English; Natalie Murray ’21, biological sciences; Nihir Nanavaty ’19, political science; Thomas Azari ‘21, individualized study, and Amrita Sarma ‘22, psychology. The team also included four non-competing alternates: Lauren Wotring ‘22, political science; Amanda Hampton ‘22, biological science; Wendy Zhang ‘22, economics and psychology; and Kaitlyn Kauffman ’20, political science. 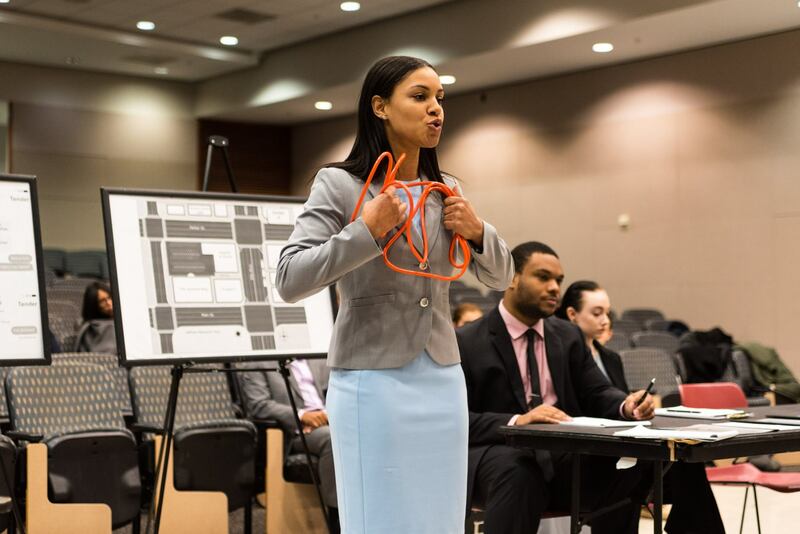 The UMBC Mock Trial program began in 2011. Ben Garmoe ’13, political science, a litigation attorney in Baltimore, co-founded the intellectual sports team with Travis Bell ’14, psychology and political science, a public defender in Alabama. Throughout the years the program’s success has drawn highly diverse, skilled, and committed student scholars, some of whom, like Garmoe, return as coaches during or after law school. 2017 UMBC Mock Trial members (l-r) Kayla Smith, Dylan Elliott, and Zuhair Riaz ’17, political science. Photo by Marlayna Demond ’11 for UMBC. 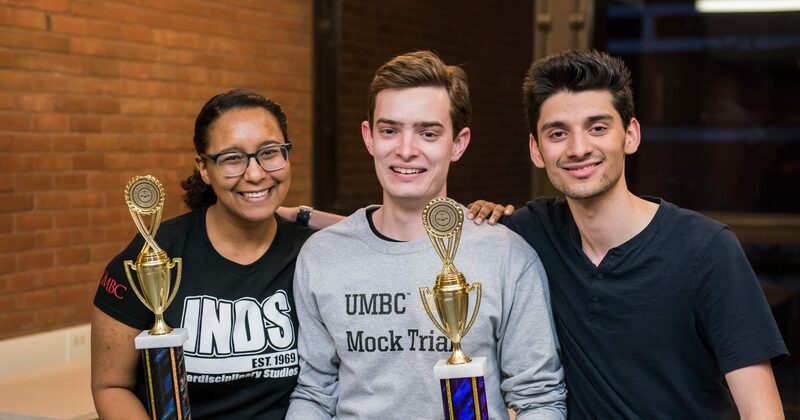 Current coaches include Summer Akhtar ’18, financial economics and political science; Dylan Elliott ’17, history; and Kayla Smith ’17, interdisciplinary studies, all members of the first UMBC Mock Trial team to go to nationals in 2017. Additional alumni coaches are Bell; Zachary Garmoe ’17, environmental studies; Jaedon Huie ’18, financial economics; and Cheyenne Smith ’16, biological sciences and psychology. Whitney Whilder, an attorney at Bodey law firm in Baltimore City, also supports the team as a coach. For some A-Team members, the road to Philly began before UMBC. Hudson, Kiley, and Gaskins joined Mock Trial at Franklin High School. Hudson helped his team finish second out of over 120 teams in the 2016 state championship. He joined UMBC’s B-Team his freshman year and watched the A- team compete in Nationals in 2017. The following year Hudson earned a spot on the A-Team, and he was elected president two years later. Hudson winning All-Region Attorney award at the 2019 regional competition. His hard work has paid off tremendously. 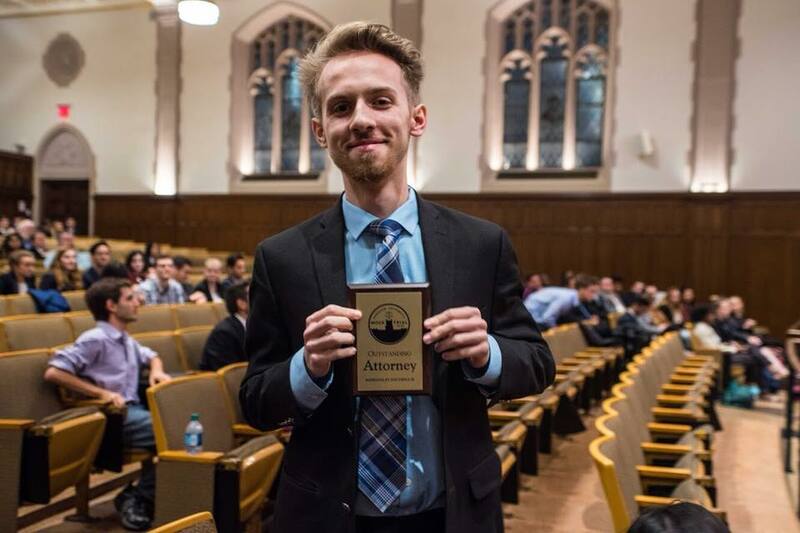 In addition to developing coping strategies and gaining confidence, he’s also been honored for his work on the team with an All-Region Attorney award at the 2019 regional competition. Hudson also now shares his strategies with his teammates and his students as a coach for three high school Mock Trial teams. He plans to follow in Garmoe and Akhtar’s footsteps and give back to UMBC as a coach after law school. As Gaskins has gained confidence through the years, she has learned to enjoy and observe the impact of her performance, and to make calculated adjustments throughout the process. Banner image: UMBC Mock Trial A-Team at AMTA 2019. All images courtesy of UMBC Mock Trial unless otherwise indicated.